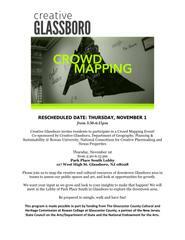 Creative Glassboro invites residents to participate in a Crowd Mapping Event on Thursday afternoon. Creative Glassboro invites residents to participate in a Crowd Mapping Event! Please join us to map the creative and cultural resources of downtown Glassboro area in teams to assess our public spaces and art, and look at opportunities for growth. We want your input as we grow and look to your insights to make that happen! We will meet in the Lobby of Park Place South in Glassboro to explore the downtown area.